Why does the ICP need a new Constitution and Bylaws? The ICP, which was founded in 1978, was established under RA 754. With the passage of RA 10657 on 27 March 27 2015, it is necessary to adopt a new ICP Constitution and Bylaws which are consistent with the new Chemistry Profession Act. A referendum is being held on the draft ICP Constitution and Bylaws and all ICP members are invited to cast their votes. Only individuals with updated ICP membership may be able to vote. The referendum is EXTENDED until 6 October 2017 (ending at 11:59PM). The 2017 AHA Presidential Advisory attacked coconut oil using studies that did not involve coconut oil. A careful review of the fatty acid composition of coconut oil and animal fat shows that: first, coconut oil has a vastly different fatty acid profile from animal fats; second, coconut oil has negligible cholesterol content while animal fats are high in cholesterol; and third, animal fats are actually not saturated fats. This casts doubt on the basis of the almost 60-year anti-saturated fat campaign which was focused on animal fat. Although the AHA Presidential Advisory claimed that it had new studies to present, it actually just reanalyzed old papers and selected the studies, some dating from the 1960s and 1970s, which agreed with its position and labeled these as “high quality.” It then rejected the studies which gave contrary conclusions, such as studies on HDL as a beneficial cardiovascular marker and the Minnesota Coronary Survey (MCS). The MCS study is important because it is a research project which Ancel Keys himself undertook but which failed to support his saturated fat-heart disease hypothesis. In passing judgment that coconut oil has “no known offsetting favorable effects,” the AHA has ignored evidence from thousands of years of its use in the tropics and Pacific islands that demonstrate its healthful properties, and the repeated observation that people who shifted from a coconut diet to a Western diet have gotten sick. The AHA produced no evidence that coconut oil causes heart disease. The AHA attack against coconut oil is a repeat of previous negative campaigns that have made the Americans obese and sick. On June 15, 2017, the American Heart Association published its AHA Presidential Advisory entitled “Dietary Fats and Cardiovascular Disease.” Although the title mentioned dietary fats, it was actually an attack on coconut oil. Although this Advisory tried to appear authoritative and objective, a detailed analysis shows that it is full of errors and biases. 1. AHA attacked coconut oil using studies that did not involve coconut oil. Although the AHA Presidential Advisory claimed that it would present the “most recent studies, on the effects of dietary saturated fat intake,” it in fact just recycled old studies and reinterpreted them using statistical arguments. Four of the studies dated from the 1960s and 1970s and had been previously criticized for being poorly executed. But more to the point, all of these studies are irrelevant to coconut oil because none of them used coconut oil as a test material: these studies used animal fat and AHA just assumed that animal fat and coconut oil are the same. They are not! 3. Animal fats are actually not saturated fats as Keys mistakenly assumed: in fact, animal fats contain comparable proportions of saturated fat and unsaturated fat. Unfortunately, most studies, including those used by AHA, assume that animal fats are saturated fats and that coconut oil and animal fats are similar. In fact, animal fat is actually composed of long-chain saturated fat with lots of unsaturated fat. On this basis alone, we can say that the whole AHA campaign against saturated fat is based on the wrong definition of saturated fat and the warning against coconut oil is not valid. This represents over 50 years of defective dietary recommendations and false information! The AHA provided an incomplete fatty acid profile of coconut oil in the table that it presented by not listing capoic acid (C6), caprylic acid (C8), and capric acid (C10) as components of coconut oil (Figure 1). These fatty acids, together with lauric acid (C12), are medium-chain fatty acids, and the AHA has consistently ignored medium-chain fatty acids as a distinct metabolic group from long-chain fatty acids. 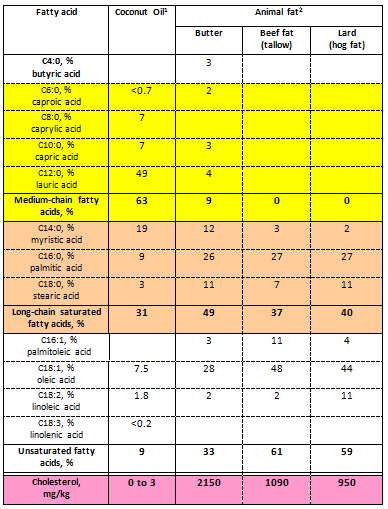 The correct fatty acid profile of coconut oil is given in Table 1. Figure 1. Reproduction of part of the fatty acid table from the AHA Presidential Advisory (AHA page e4). AHA excluded capoic acid (C6), caprylic acid (C8), and capric acid (C10) as components of coconut oil and lumped all saturated fats into one group. Table 1. Fatty acid profile and cholesterol content of coconut oil and various animal fats. 1 Codex Alimentarius 210-1999, amended 2015. Median values are calculated. The AHA Presidential Advisory is clearly full of errors. 2. The AHA ignored studies that were unfavorable to its position. AHA selected information that was in favor of its agenda and ignored other facts that were unfavorable, in particular, those pertaining to LDL and HDL, and the Minnesota Coronary Survey. The AHA tried to further discredit coconut oil by ignoring the beneficial effects of coconut oil on HDL claiming that: “changes in HDL cholesterol caused by diet or drug treatments can no longer be directly linked to changes in CVD, and therefore, the LDL cholesterol-raising effect should be considered on its own.” (AHA page e13) The justification for this statement was based on a study that showed that a genetic variant rendered HDL as an unreliable marker for protection against heart disease. However, this genetic variant was found in only 2.6% of the population. Similarly, a recent paper reported that extremely high HDL levels may increase the risk of death but this was found in only 0.4% of men and 0.3% of women. Clearly, these examples represent a minority of the population and are outliers. Extremely high and low HDL (and LDL) levels are unhealthy but this does not negate the value of HDL as a beneficial cardioprotective marker for coconut oil. The Minnesota Coronary Survey (MCS) was a study that Keys himself designed and implemented together with Ivan Frantz Jr. MCS was meant to finally prove Keys’s saturated fat-heart disease hypothesis using a large number of subjects (n=9,423), a long feeding period (4.5 years, from 1968-1973), a high level of dietary control, and double blind randomized design. This study was conducted at the same time that Keys was coordinating the Seven Countries Study and would have provided powerful validation for his saturated fat-heart disease hypothesis. In the end, Keys did not participate in the publication of the results of the MCS study. A partial report was made in a 1989 paper with Frantz as lead author but without Keys as co-author. This work remained hidden until 2016 – forty-three years after its completion – when the raw data were unearthed and turned over to Ramsden and co-workers, who then analyzed the data. The main conclusion from the MCS study was that a high omega-6 diet effectively lowered serum cholesterol, but also increased the risk of heart disease, a result that was the opposite of what Keys desired. The AHA eliminated the MCS study from its list of “high quality” core studies because of its “short duration, large percentage of withdrawals from the study, and intermittent treatment, which is not relevant to clinical practice.” (AHA page e7) They conveniently ignored the fact that the MCS study was longer than some of the “high quality” studies that it cited and was likely better designed and implemented (by Keys himself). The AHA concern regarding subject withdrawals had already been adequately addressed previously by Broste and Frantz. The AHA also critiqued the use of “lightly hydrogenated corn oil margarine in the polyunsaturated fat diet” which would have contained trans-fat, which is known to raise cholesterol. Ramsden and co-workers addressed this concern in their paper by pointing out that both Keys and Frantz were well aware of this problem and had already devised diets from previous studies which achieved reductions in cholesterol. The MCS study should remain an important study for consideration notwithstanding the AHA objection. The AHA Presidential Advisory is clearly biased. 3. Coconut has always been part of a healthy traditional tropical and Pacific island diet. Obviously, the AHA is of the opinion that the perception of coconut oil as a health food is just a health fad and that, as previously mentioned, it has “no known offsetting favorable effects.” Coconut oil may be a fad in the US, but it has been part of a healthy traditional diet in the tropics and Pacific islands for thousands of years. The AHA probably believes that a healthy diet can only be proven within the confines of its clinics and laboratories and not in the real world where people actually consume the food. The AHA does not realize that people cannot live on a tropical island and not consume coconut every day, and that despite this, do not suffer from heart disease. The AHA is obviously unaware of the numerous published studies that document how Pacific island inhabitants who shifted from a coconut diet to a Western diet became more prone to heart disease and obesity. The AHA wants us to miss the forest for the trees: There is no evidence that coconut oil causes heart disease; instead, they want to focus only on LDL. At the same time that the AHA is attacking coconut oil, it has been promoting a high omega-6 diet. In 2009, AHA issued a science advisory which endorsed a minimum of 10% omega-6 in the diet, contrary to the recommendations of international health agencies to limit total omega-6 + omega-3 fat consumption to about 8%, and to keep an omega-6 to omega-3 ratio of no more than 5:1. The excessive consumption of omega-6 fat and deficiency in omega-3 fat may be one of the major contributors to the epidemic of obesity and diabetes in the US. It is soybean oil, an omega-6 fat, which has profited the most from the AHA support for a high omega-6 diet and warning against coconut oil. In 1987, the American Soybean Association launched a “truth-in-labeling campaign” to demonize coconut oil to “increase market share for soybean oil.” This campaign, which came to be known as the Tropical Oils War, severely damaged the coconut industry. Today, soybean oil accounts for 55% of the edible vegetable oil consumption in the US and the soybean industry has been funding the AHA in the guise of supporting its health campaign to further increase its market share. In exchange, AHA is once again using defective science that demonizes coconut oil and makes Americans obese and sick. The studies that the AHA selected as “high quality” were the following: a. Morris et al. Controlled trial of soya-bean oil in myocardial infarction. Lancet 1968; 2: 693–699; b. Dayton et al. A controlled clinical trial of a diet high in unsaturated fat in preventing complications of atherosclerosis. Circulation 1969; 40 (suppl II): 1–63; c. Leren. The Oslo Diet-Heart Study: eleven-year report. Circulation 1970;42:935–942; d. Turpeinan et al. Dietary prevention of coronary heart disease: the Finnish Mental Hospital Study. Int J Epidemiol 1979; 8: 99–118. Here is an example of a critique of the Finnish Mental Health Hospital study: Pietinen P, Ascherio A, Korhonen P, Hartman AM, Willett WC, Albanes D, Virtamo J (1997). Intake of Fatty Acids and Risk of Coronary Heart Disease in a Cohort of Finnish Men. Am. J. Epidemiol. 145 (10): 876-887. Sampling of references: a. Bach & Babayan. Medium-chain triglycerides: an update. Am J Clin Nutr 1982; 36: 950-962; b. Schonfeld P, Wojtczak L (2016). Short- and medium-chain fatty acids in the energy metabolism – the cellular perspective. Journal of Lipid Research 57: 943-954; c. Huang CB, Altimova Y, Myers TM, Ebersole JL. Short- and medium-chain fatty acids exhibit antimicrobial activity for oral microorganisms. Arch Oral Biol. 2011; 56(7): 650–654. Eyres L, Eyres MF, Chisholm A, Brown RC. Coconut oil consumption and cardiovascular risk factors in humans. Nutrition Reviews 2016; 74(4): 267–280. a. Voight BF et al. Plasma HDL cholesterol and risk of myocardial infarction: a mendelian randomisation study. Lancet 2012; 380: 572–80; b. Hewing B, Moore KJ, Fisher EA. HDL and Cardiovascular Risk. Time to Call the Plumber? Circ Res. 2012; 111: 1117-1120. Madsen CM, Varbo A, Nordestgaard BG. Extreme high high-density lipoprotein cholesterol is paradoxically associated with high mortality in men and women: two prospective cohort studies. European Heart Journal 2017; 38: 2478–2486. Frantz ID Jr, Keys A. R01 HE 0986-03 Research Grant Application: Effect of a Dietary Change on Human Cardiovascular Disease “The Minnesota Coronary Survey”. 1967. Frantz ID Jr., Dawson EA, Ashman PL, Gatewood LC, Bartsch GE, Kuba K, Brewer ER. Test of Effect of Lipid Lowering by Diet on Cardiovascular Risk. The Minnesota Coronary Survey. Arteriosclerosis 1989; 9:129-135. Ramsden CE, Zamora D, Majchrzak-Hong S, R Faurot KR, Broste SK, Frantz RP, Davis JM, Ringel A, Suchindran CM, Hibbeln JR. Re-evaluation of the traditional diet-heart hypothesis: analysis of recovered data from Minnesota Coronary Experiment (1968-73). BMJ 2016;353:i1246. Broste SK. Lifetable Analysis of the Minnesota Coronary Survey. MS thesis, 1981. University of Minnesota. Gunn BF, Baudouin L, Olsen KM. Independent Origins of Cultivated Coconut (Cocos nucifera L.) in the Old World Tropics. PLoS ONE 2011; 6(6): e21143. Prior I. Epidemiology of cardiovascular diseases in Asian-Pacific region. Singapore Medical Journal 1973; 14(3): 223-227.
a. Galanis DJ, McGarvey ST, Quested C, Sio B, Afele-Fa’Amuli S. Dietary Intake of Modernizing Samoans: Implications for Risk of Cardiovascular Disease. Journal of the American Dietetic Association 1999; 99(2): 184–190; b. World Health Organization. Diet, food supply and obesity in the Pacific.2003. WHO Regional Office for the Western Pacific. ISBN 92 9061 044 1. Harris WS, Mozaffarian D, Rimm E, Kris-Etherton P, Rudel LL, Appel LJ, Engler MM, Engler MB, Sacks F. Omega-6 Fatty Acids and Risk for Cardiovascular Disease. Circulation 2009; 119: 902-907.
a. Simopoulos AP. The importance of the ratio of omega-6/omega-3 essential fatty acids. Biomed Pharmacother 2002; 56(8): 365-79; b. Simopoulos AP. The Importance of the Omega-6/Omega-3 Fatty Acid Ratio in Cardiovascular Disease and Other Chronic Diseases. Exp Biol Med 2008; 233(6): 674-688; c. Simopoulos AP. Genetic variants in the metabolism of omega-6 and omega-3 fatty acids: their role in the determination of nutritional requirements and chronic disease risk. Exp Biol Med 2010; 235: 785–795. US Department of Agriculture Economic Research Service. ERS Oilseed Yearbook 2014. The Philippine Federation of Chemistry Societies (PFCS), the umbrella organization for the different chemistry societies in the country, is pleased to announce the election of Dr. Glenn Alea as its President, assuming the post on 19 July 2017. Dr. Alea is a graduate of De La Salle University (DLSU) in Manila, where he obtained his BS (1987), MS (1993), and PhD (1998) chemistry degrees. His MS thesis is on natural products involving the isolation, characterization, and structural elucidation of terpenes from the soft coral Clavularia inflata. He did his research at the James Cook University in North Queensland, Australia. From 1994 to 1998, he was a PhD fellow of the Department of Science and Technology – Engineering and Science Education Program (DOST-ESEP). He was a research fellow from 1997 to 1998 at the Southampton University in the United Kingdom doing organic synthesis. His dissertation involved the synthesis and characterization of tetrathiafulvalene derivatives and macrocycles containing sugar units. Dr. Alea’s research interests include the syntheses of tetrathiafulvalene macrocycles, cobaltadithiolene complexes, pyrazinamide and isoniazid derivatives, phthalimide derivatives, and thiazolidinedione derivatives. His papers have been published in various journals and presented in local and international conferences. Dr. Alea has been with the Chemistry Department of DLSU since 1987 and has more than twenty years of teaching experience to his name, rising from assistant lecturer to associate professor. 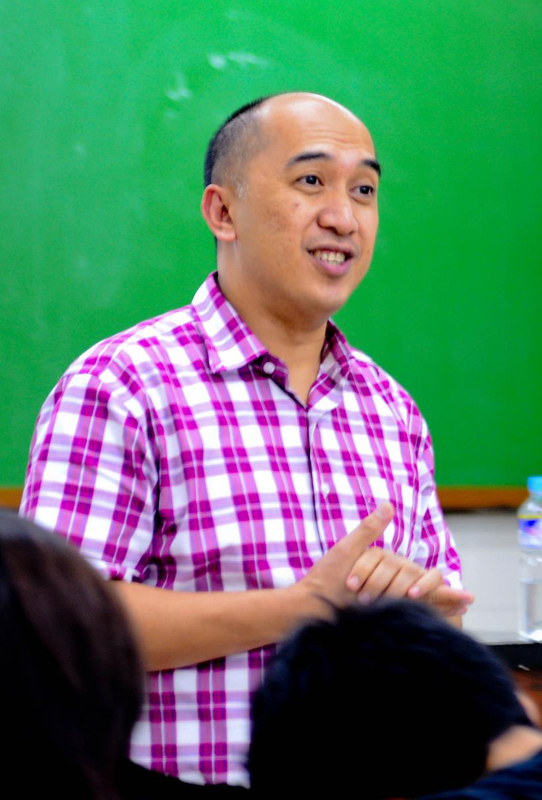 Among his iconic projects is the DLSU Chemistry Challenge, a chemistry quiz-bee type contest for high school students, which he initiated in the year 2000. He has been the Department Chair since 2015, and is in charge of the strategic direction, management, and coordination of the academic programs in line with the Department’s mission-vision. Come September 2017, Dr. Alea shall become Dean of DLSU’s College of Science. In addition to his role in the PFCS, Dr. Alea is also the Vice President for Internal Affairs of the Integrated Chemists of the Philippines (ICP), the Accredited Professional Organization (APO) of licensed chemists and chemical technicians recognized by the Professional Regulation Commission, since being first elected in 2011. He also became a member of the three-person CPD Council for Chemistry in 2017. He is married to the former Cristina Hinagpis and they have two children, Alzea and Yana. In his free time, Dr. Alea plays badminton with members of DLSU’s chemistry community. We would like to thank all those who voted / participated in this election. Let us all continue to support the different activities of the ICP. Below is a copy of the official letter sent to the relevant personalities of GMA News Network for their unfair depiction of chemists in one of their TV reports aired last 13 July 2017. A copy of this letter may be downloaded at this link. On behalf of the Philippine Chemistry community, I wish to express our profound disappointment regarding your irresponsible use of the term “chemist” of the drug raid titled “Tsongkilate” which aired by GMA News last July 13, 2017. It was clear from the coverage that the person who was apprehended was NOT a chemist. Such irresponsible use of terms belies a lack of appreciation for truth and accuracy of news reporting. Chemistry is a very difficult and demanding subject and the country badly needs more Chemists to keep our competitiveness, support public safety and ensure a clean environment. Your thoughtless and incorrect use of the term damages this important profession and paints Chemists as drug pushers and criminals. Would parents encourage their children to take up this subject given your very negative news coverage? This news item has done a great disservice to Chemistry, a discipline and profession that the country needs to strengthen. We ask GMA News to correct this error and to refrain from committing such irresponsible statements in the future.